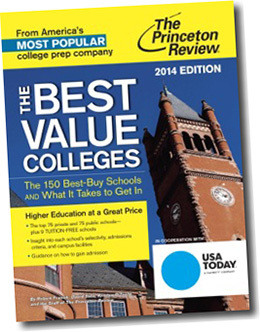 ESF has again been named one of the nation's 150 "Best Value" colleges and universities by The Princeton Review. The 2014 college guide describes ESF as "nationally renowned" and "highly specialized and selective," and quotes ESF students who described the College as "dedicated to its mission of sustainability." and as an institution where professors "set the bar high for expectations and keep it there." The 150 "Best Value Colleges" were selected based on institutional data and student opinion surveys collected from 650 colleges and universities the company regards as the nation's best undergraduate institutions. The selection process analyzed more than 30 data points broadly covering academics, cost and financial aid. Data from students attending the schools, collected from fall 2012 through fall 2013, included their assessments of professors and their satisfaction with financial aid awards. The list includes 75 public and 75 private schools. The ranking earned ESF a place in the new edition of the Princeton Review's annual book, "The Best Value Colleges: The 150 Best-Buy Schools and What It Takes to Get In."